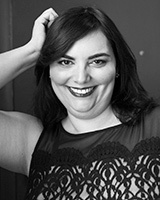 Mezzo-soprano Jennifer Webb joined Cantata Singers in 2011, and she has been featured as soloist numerous times with the ensemble, including the premiere of Peter Child’s Lamentations, Mendelssohn’s Elijah, many Bach works (Magnificat, cantatas, and Mass in B minor), and Handel’s Israel in Egypt. She also appears frequently as part of the Cantata Singers Chamber Series. Her 2017-18 season included performances with Cappella Clausura, and as a member of King’s Chapel Choir, which gave the United States premiere of a recently discovered work by C.P.E. Bach. She appeared in the first staged performance of Elena Ruehr’s Cassandra In the Temples and the premiere of Ruehr’s Crafting the Bonds, both with Cappella Clausura; Copland’s In the Beginning with the Oriana Consort; and Brahms’ Alto Rhapsody. She appears on two recordings as a member of the Christmas Revels Chorus. Ms. Webb graduated from Oberlin College, where her love for early music was sparked in the Oberlin Collegium Musicum. She studies voice with Mary McDonald Klimek. Ms. Webb is also a reference librarian at Lexington’s Cary Memorial Library.